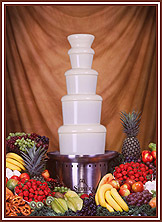 We are a full service chocolate fountain rental business. We can provide the dipping items if requested by the facility caterer and or the client. But for the most part we deal with the rental of the chocolate fountain, the chocolate and the skewers. Our professional touch shines through as we set up, attend our fountain and to the guests and break down and clean up. The fountain attendant is responsible for helping the guests with dipping technique and passing of plates and napkins. We pride ourselves with top notch customer service and quality. Pricing Includes: 2 hours of chocolate flow time with attendant. 16 lbs. Of Dark, White or Milk Chocolate. - All of which are premium, Belgian chocolate, skewers, and set up and clean up. Prices start at $375.00. - Per person if also to supply dipping amenities $3.00. 12 lbs. of Dark, White or Milk Chocolate. 2 hours of Chocolate flow time. The sky is the limit. Use your imagination!!! Copyright © 2006 · Powered by Aardvark & Associates, Inc.